I have a habit of not throwing things away. Keep them with me for years and years. This also creates a little trouble in my life from time to time. People who advocate minimalist approach, say that it is not just clot and clutters your physical lifestyle and mental state. I have old New Year cards sent by my school friends, a small container that mom sent snacks couples of years back; there are so many countless things, a little swan by brother's friend bought with his pocket money, my paper where I received a great compliment from my teacher. Not only physical attributes, but fragrances, little fragments of childhood lullabies, a small conversation, people names, compliments, so many things stay with me. If you are a mother or parent, you might know how much your child's milestone memories matter to you. Just the other day we had our community get together. I was planning on what to wear, then an old saree came to my mind, which I wore for my sons 1st birthday about eight years back. My husband gifted a dual tone peach chiffon with antique gold round embroidery. That's it; I picked the saree as it had to do with my sons 1st birthday. I added a gold choker, cocktail ring, a thick bangle and gold watch. I quickly switched over the blouse with a bell sleeves top for instant pump up and fresh new vibe. Sometimes old things that create hassle, give you the immense pleasure of wearing and riding your absolute favorite memory ride instead. Perhaps the beauty of life lies in the small things and small imperfections. Wow, this saree is so gorgeous! I'm glad you pulled it back out for your event. You look absolutely stunning! I am like you I tend to hole on to belongings and if I had a saree as beautiful as this there is no way I would be able to part with it either. that pink saree is just so beautiful! I also kept a lot of stuff until I moved to a new country and I had to fit my life in one bag only. Then I had to give up most of my things and since then I try to live a minimalist lifestyle. This saree is gorgeous so I'm glad you held onto it! I've been trying to find a balance lately of keeping things that are sentimental and purging things I really don't need. My community faced devastating losses to the tune of about 5,000 homes last month, and since we were faced with possibly losing our own, it has really helped to put things into perspective for me. I am definitely not a minimalist either so I hear you about holding onto things. The saree is beautiful and it is great that you were able to wear it for your community get together! Loving the colour of your saree, so gorgeous, I need to do a second clean up and declutter some few items that always refuse to reach the bin every time. Such a beautiful outfit, you look stunning! I can relate to the clutter, I try not to do it but there are some things just too sentimental not to keep! I move a lot with the military, so it just makes since to pair my life and possessions down to what I need and the things I love. You do look lovely, I bought a sari in my travels, and hope to have somewhere to wear it soon. I am guilty of holding on to things, mainly for sentimental reason. What you wore looks stunning. The accessories you add really finish it off. Absolutely beautiful!I love the color and the intricate detail. See,it's always good to hold on to stuff, you never know when you will need it later! What a beautiful saree. Thanks for sharing.! I think holding on to sentimental things is absolutely fine - it evokes precious memories. Love your outfit too - gorgeous. You look gorgeous. The color looks stunning on you. You made the right choice by holding on to that saree! You look gorgeous! That saree is beautiful and looks great on you. It's a beautiful piece. I am so with you, I love holding on to the things which I have my emotions attached to. I still have my school notes where my teacher appreciated my work and now it is my kid's notes which I love the same way and treasure them. You look absolutely gorgeous in that saree, the bell sleeve top worked really well as a blouse, modern and chic. I'm still holding sentimental things, When I seeing it I remember the happy moment the time had those things. That Saree is really beautiful like you! Nice photos! You look great in that outfit! I used to hold onto a lot of memories, but I lost them all in one night and ever since then it has become extremely painful to become too attached to anything physical. It's incredible how outfits can hold such sentimental memories for us. You look lovely! Hope there are many more amazing days wearing that outfit. I love your outfit. It's simple to make an old outfit look refreshed with a few changes and accessories! I love your saree...such a pretty color..i also declutter once in a while but it is hard to part with my beloved clothes! its pretty saree, i like the color of it, i looks awesome on you. I like to keep stuff for years as well, i think its good to keep old stuff. I too have a hard time getting rid of things. It can be bad but I like to keep things that are sentimental to me. Holding on to things is something I have done for the past 40+ years but have now downsized. Now I only keep little pieces of things or items to save which I can keep in on container. I love your outfit and the color looks amazing on you. Thanks for sharing your thoughts and your beautiful outfit. It's lovely fashioned either way. Even more awesome that it has a lovely memory x2 now, attached to it. I love this bell sleeve blouse design. This is giving a modern look to your saree. WOW!! !This is so beautiful! I am like you I tend to hold on to everything especially when it has to do with my kids. When there are things that have sentimental values, I tend to keep them regardless of the size. Once you throw some of those sentimental things away, it seems like you're throwing away your memories. It's hard to throw things away, but we need to keep a balance of what we should keep. I LOVE your outfit! What a pretty color. It looks so good on you!! That saree is just beautiful what a gorgeous colour, I love how you have teamed it with gold. I am awful for hanging onto things as well. You look so pretty in this. I just love this color. And I hold onto things too. I'm a bit of a pack rat. I do hold onto a lot of things. My daughter paperwork from school is a huge problem for me. That is a beautiful saree. I'm glad you found it and it worked out for you. Beautiful saree! I love the color and the purse as well. 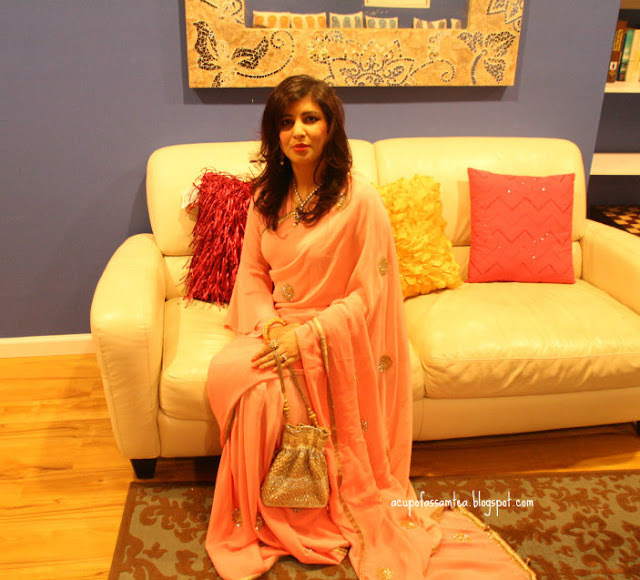 I've worn a saree once in my life and it was real struggle not to fall haha. That saree is just beautiful, and the color is gorgeous. My husband tends to hold on to many things that I'd usually just toss out. That's a nice colour for the Saree and looking good on you. It becomes difficult to keep everything managed when there is so much that you want to keep as a memoir. I love this color on you! And how special this outfit is having been bought by your husband for your boy's birthday! Very nice! That's a beautiful color on you! Keeping things that are important and cutting down on all the extra junk is such a good idea. I think half of the stress in many of our lives comes from trying to take care of things that we don't need or use. I have been working on going through all my bins of memories. I have a lot of things from when my Son was little that I held on to. I need to downsize it a little. That is a beautiful outfit on you. the color looks amazing with your skin tone. What a beautiful outfit! It looks so elegant and classy. Just the other day I was going through our hall closet and came upon baby clothes that belonged to my grown daughters. Just seeing and holding the items brought back a flood of precious memories! You look amazing! So elegant. That saree is gorgeous. You look so beautiful in this outfit! I really love that shade of peach!I also tend to hold on to items that give me warm and happy memories. I always enjoy looking through them and remembering the good times. You look beautiful in peach! I think it's up to the individual you must do what feels right for you. If those small treasures make you happy I say keep them. That is such a gorgeous dress. You look super amazing! 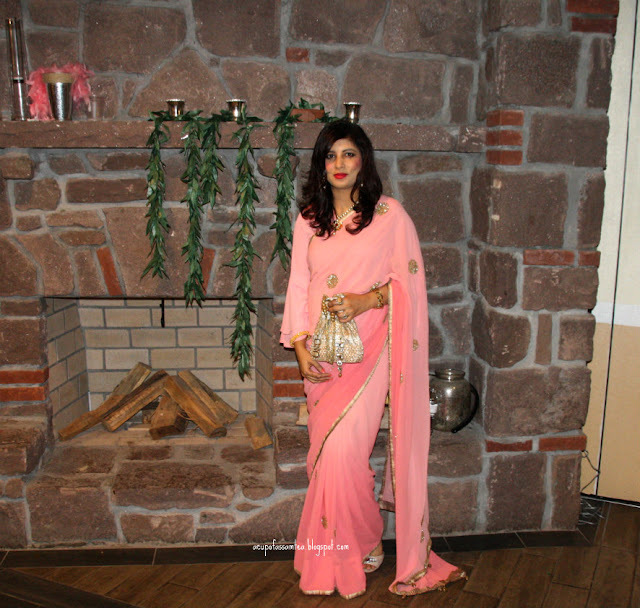 I can’t get over how gorgeous the pink saree is on you!! You wear it so well and the color looks amazing! It is the perfect compliment to the gold pieces! I love your pink saree! It's one of the best I have seen as I have a lot of Indian friends. I have a tendency to hold onto the little things in life also. I still have things from my childhood, even my parent’s (although I wasn’t even born then!). I just love things that create lasting memories but I also love to keep a clean house so it’s all about balance! Oh. You simply looks so gorgeous. Yet it's way back 8-years ago. Can't believe how it totally looks so good.